I'm a lifelong resident of the Greater Bangor Area who has been writing since I was old enough to hold a pen. I currently have had 50 short stories published in anthologies and magazines in the United States, Canada, and the United Kingdom. My favorite venues in which to write include all forms of speculative fiction, including science fiction, fantasy, supernatural horror, and more outré forms such as absurdism. You can learn more about my writing at my writing web site. By day, I work as a Special Sections writer for the Bangor Daily News. I write everything from general-interest pieces to features to advertorial for newspaper supplements that we publish about 100 times per year, some of them inserted into other daily newspapers statewide. As part of my job, I'm also a photographer and I design layouts for the sections I edit. 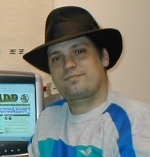 In the 1990s and 2000s, I ran a tech-oriented business that started out fixing computers but quickly led to designing Web sites, doing graphic design, and doing layout projects. I have laid out magazines, books, and even an independent newspaper, along with my regular layout duties at the BDN. I believe anyone can write a good, engaging short story that is publishable. I first taught this course through United Technologies Center in Bangor, but the course was quite expensive and I don't think too many people were looking for courses on creative writing at a technical school. I then taught the course through Bangor Adult Education, where the rates were far better, and the first semester filled up nicely. While the course is through BAE, I plan to independently publish anthologies of the students' stories following each semester.